Dreams come true, and I’m thrilled to share this one with you. Using the $15 Reflection App on an Apple computer, it’s now possible to MIRROR the screen of an iPad2 or iPhone4S right on your screen. This essentially makes your Apple computer function like an AppleTV for iOS mirroring, except you don’t need to purchase and install a $99 AppleTV with a HDMI cable. This is HUGE for teachers and anyone else needing to share an iPad screen with students over a projector. Previously, iDemo was the only software solution which “kind of” offered this functionality, but it required people to jailbreak their devices. While iDemo is cross-platform, the Reflection App is not. iDemo also required an app (like ScreenSplitr) be installed on your jailbroken iOS device to mirror. 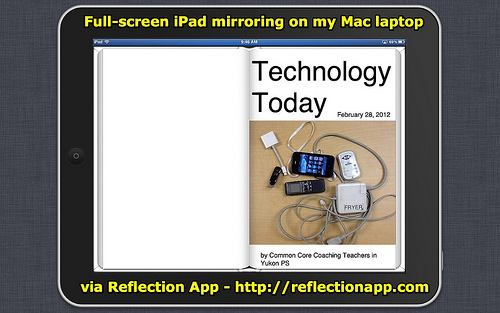 With the Reflection App, you don’t need to install anything on your iPad2 or iPhone4S. Now when you view any application on your iPad2 or iPhone4S, that entire application will be “mirrored” on your Mac computer. 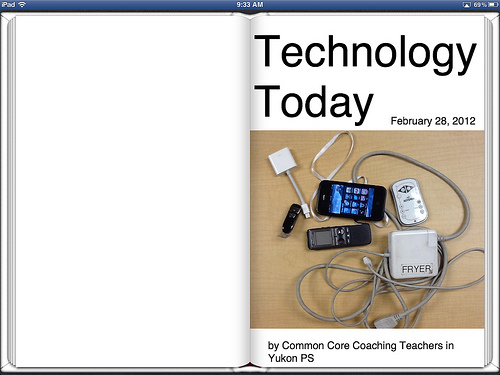 Here is the iBooks application showing the enhanced eBook I created Tuesday afternoon with teachers in Yukon Public Schools at a professional development workshop. Here’s a screenshot of my laptop screen, in “full-screen” mode using the Reflection App. 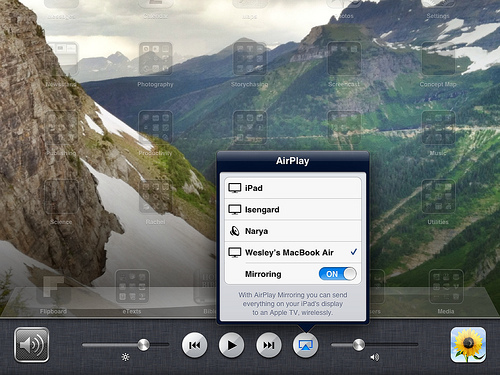 You can use the keyboard shortcut “Command-F” to toggle in and out of fullscreen mode. I love it! I’ll use this app tomorrow in Kansas City at the “Enhancing Teaching & Learning Conference,” presented by the Kansas City Professional Development Council. In addition to my keynote on “Improving Reading, Writing and Critical Thinking Skills with Media” I’m sharing a breakout session on “Creating MultiMedia eBooks.” That eBooks session will be repeated next week on Tuesday afternoon at the Heartland eLearning Conference in Edmond, Oklahoma. I am SO THRILLED to have a way to mirror my iPad directly on my laptop and therefore to available room LCD projectors. Hat tip to the amazing early childhood technology and learning guru, Gail Lovely, for sharing the Reflection App via Twitter yesterday!